Cyprus - welcoming the sunny island in the Mediterranean Sea, which is famous for golden beaches and variety of entertainment. Among his paintings of landscapes stretch wonderful citrus grove, and ancient ruins coexist comfortably alongside modern cities. Holidays in Cyprus has long been a popular destination. Cyprus is in the eastern Mediterranean, which determines its climate, as the rain, typical of other islands in the region. However climatic features Cyprus largely different from those, that are observed in other parts of the Mediterranean. On the uniqueness of the local climate suggest endemic species of flora and fauna, which are found only here. For holidays in Cyprus at any time of the year there are many opportunities. But the most popular is the season of beach holidays, which lasts from May to October. Already in April, the water begins to warm up +20 degrees, and the temperature rises to +23 -+25. In May already really warm, air and water temperatures are comfortably swim, and the island blooms and greens. Opens beach season holidays in Cyprus. The hottest period occurs in July and August, when the air is heated to 30-35 degrees, a water - to 26-28. However, due to low humidity, heat is easy enough. In September, the summer heat slightly decreases, although the day is still hot, and the sea water is still warm and keeps the temperature to +24 – +26 degrees. Nighttime temperatures do not fall below +21 – +23. Many tourists choose to holiday in Cyprus in October. Especially comfortable during this period for families with children or older couples. Daytime temperatures are kept at the level of +24 – +26 degrees. Due to the absence of cold currents, water quickly cools down. In November, there are all the signs of autumn, resorts are empty, the rains and stormy winds. The November afternoon temperatures no higher than +21 degrees, and lowered at night to +13 – +15. In December, starts the winter season holidays in Cyprus. In the mountains, snow falls, open ski resorts. Daytime temperatures on the coast down to +15 – +16 day and to +5 – +8 at night. By the end of February and in early March the island is transformed before our eyes. Although the water in the sea is still cold, but the rains stop, and the air is gradually warmed up to +20 – +21 degrees. In March comes the most convenient time for those, who are interested in educational holidays in Cyprus. excellent ecological environment, clean sea air. The city grew from a small fishing village, which was founded on the site of the icons found. Since 80, he gradually became one of the best centers of youth recreation in Cyprus. With an abundance of entertainment options, Resort is famous for lively nightlife. Bars and nightclubs are located in the city center, and in the vicinity there are many interesting sights. Ayia Napa Monastery, gave its name to the resort, It was built in 15 century, during the Venetian rule in Cyprus. In the middle of the last century, it was restored and today serves as a museum for tourists in Cyprus. Services are held in the new church was built nearby. At the entrance to the patio attracts the attention of a huge sycamore, whose age, as the locals say, no less 600 years old. Along the coast of Ayia Napa runs a chain of bizarre grottoes, created by the rough seas for centuries. Local legends say, that hid the treasures of the Mediterranean pirates in these caves. Sea caves in Cyprus - a favorite place of the adventure lovers. Despite signs prohibiting, many tourists are willing to risk, jumping from the ten-meter cliff, navisajuщej gives morem. During low tide, many grottos open passages by land. Ayia Napa has a large water park, attractions which are created based on the myths of Ancient Greece. Among their many visitors can choose the extreme slides or pools. For younger guests, a playground. 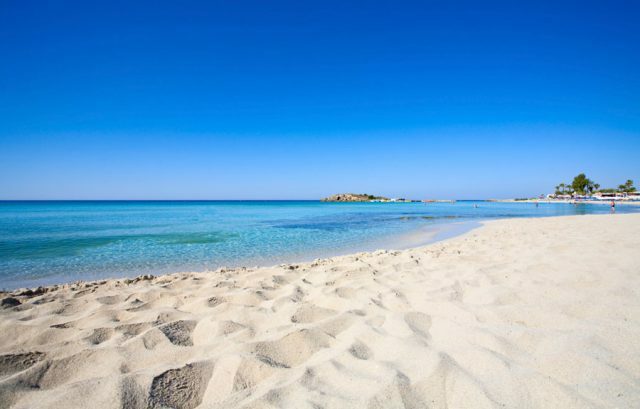 Holidays in Cyprus, on the white beaches of Ayia Napa, It considered one of the best. soft sand, clear water and a gentle entry into the sea make the beach suitable for children and adults. Almost all of them marked "Blue Flag". Hotels in Ayia Napa are characterized by excellent service, which compensates for the higher prices, than at other resorts. many hotels, focused on a family holiday in Cyprus. Located on the shore of a cozy bay, and is ready to offer its guests a luxurious apartment with an elegant interior. huge room, decorated in warm colors, elegant wooden furniture. From the panoramic windows down elegant draperies from expensive fabrics. On the territory of Spa-Salon, There are several large swimming pools and tennis courts. One of the best hotels in Cyprus for a holiday by the sea with a private beach area and swimming pools. The complex of three buildings, connected by passages, surrounded by beautiful greenery of a tropical garden. Nearby is a golf course. The hotel offers all facilities for families with children. There is a mini-pool and playground, provides babysitting and children's table. The spa offers massages and aerobics classes. Paphos is the most expensive resort for holidays in Cyprus. Rising above the coast mountain range protects the city from the hinterland, so that there was formed a special microclimate. Frequent winds bring cool in summer and warm in winter. The resort has excellent infrastructure, designed for an elite audience, and five-star hotels make holidays in Cyprus comfortable at any time. Paphos is famous for its ancient history. According to archaeologists, the city already existed in antiquity. The first settlement, which arose on the site, It was the center of the cult of Aphrodite. In the city and now a lot of places, associated with her name. for example, a popular tourist attraction is the Rock of Aphrodite, which, according to legend, It is the place of her birth. The number of tourist sites, popular for cognitive rest in Cyprus, includes other attractions. In the harbor of Paphos is a monument 13 century - the medieval fortress, played the role of a defensive structure. The building is a tower with an inner courtyard. On the ground floor of the tower were prison cells, room of the second floor served as the mosque during the Ottoman rule. Today, the fortress was the venue for the annual Opera Festival. Coast in the Paphos region differs rocky terrain, therefore, there are small-pebbled areas. However, all the beaches of Cyprus are well-equipped for rest. On the pebble beach paved wooden walkway for easy entry into the sea. Close to magnificent sandy beaches, equipped with an excellent infrastructure of water activities, there are small rocky coves hideaway. On the coastal line there are hotels of different categories, most of which has its own beach area. One of the best resort hotels in Cyprus for a beach holiday. It offers spacious rooms with a terrace or patio. A two minute walk away and private beach, and several swimming pools operating in the territory of, including, covered. There are a variety of opportunities for outdoor activities and water sports. a playroom for children are organized, babysitting, children's menu. Great vacation in Cyprus will provide waterfront five-star hotel Annabelle. Its spacious apartments are decorated in bright colors and furnished with comfortable modern furniture. Balconies with carved bars overlook the beautiful landscaped garden with tropical plants and waterfalls. There are facilities for children - a menu in a restaurant, game room, mini-pool. Guests can explore the surrounding sights of Cyprus or stay active on the water. The town of Protaras is located in the south-eastern part of Cyprus and is known for beautiful sandy beaches, beautiful fig trees and excellent diving. In ancient times on the site of an ancient Greek polis Protaras was a convenient harbor, from which subsequently were only ruins. In their place grew a small hamlet, evolved into a popular modern resort. 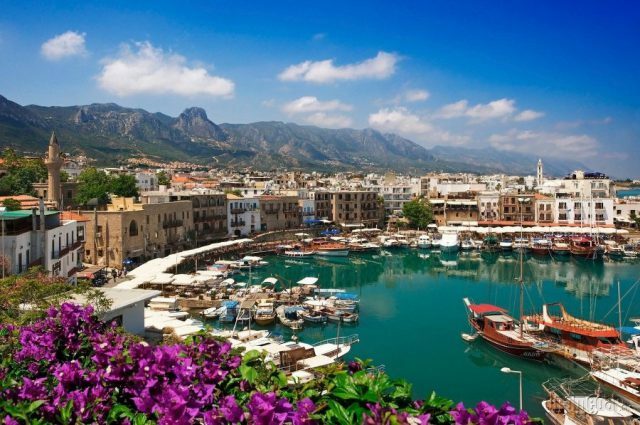 Lovers of sightseeing holiday in Cyprus will not be bored in Protaras. The town and its surroundings are many interesting sights. Popular with tourists is the small church of the Prophet Elijah, built atop a coastal hill. The construction dates back to 15 century and attracts an interesting medieval architecture style cathedral. Built of sandstone small building with arched entrance surmounted by a dome with a spire. On the structure of the bell tower adjacent square. Attraction attracts tourists in Cyprus tourists with unique frescoes and ancient wooden altar. Next to the church is growing old "Tree of Wishes", hung with ribbons and snaps many pilgrims. Oceanarium Protaras - the largest on the island. It gives a great opportunity to meet with an unusually rich marine life of the Mediterranean. 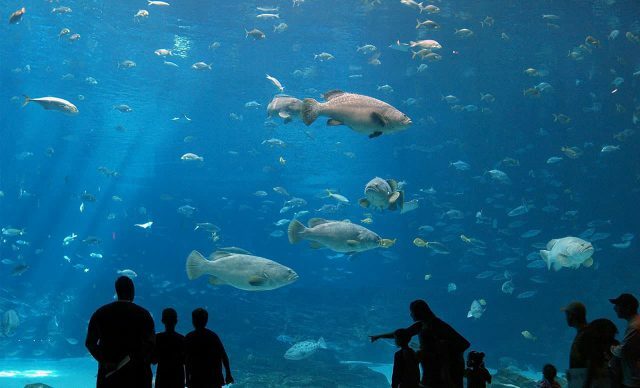 The huge glass aquariums, in conditions, as close as possible to the natural, there are more than 1000 sea ​​animals. Children will long remember the holiday in Cyprus fascinating excursion to the aquarium. They will delight polar penguins, are rapidly worn in water, and land-based fun transshipped. Many spectators gather fascinating spectacle of the dancing fountains in Protaras. A magnificent dance of water jets, versicolored, accompanied by a beautiful musical compositions. For divers Protaras - one of the most exciting holiday destinations in Cyprus. In the vicinity of several dive sites with a fascinating immersion program among coastal caves. Coast Protaras oriented, basically, on a relaxing family vacation on the comfortable sandy beaches. They are located in small bays, protected from the winds rocky shores, and equipped with excellent infrastructure. The beach hotel offers all facilities for a holiday in Cyprus with children. The hotel offers comfortable rooms with a furnished balcony and sea views. The building is surrounded by lush tropical gardens and greenery. There are tennis courts and a swimming pool with separate children's area. For younger guests there is a playground, preparing animation program, once a week to arrange a disco. There are babysitting services. The perfect place for family holidays in Cyprus. The Beach Hotel is broken wonderful landscaped gardens with waterfalls and artificial ponds with fish. Its shady walkway down to the sandy beach. For young children, a kids' club, a playground and a mini-pool. Adult guests are provided gym, heated pool, SPA center with sauna. 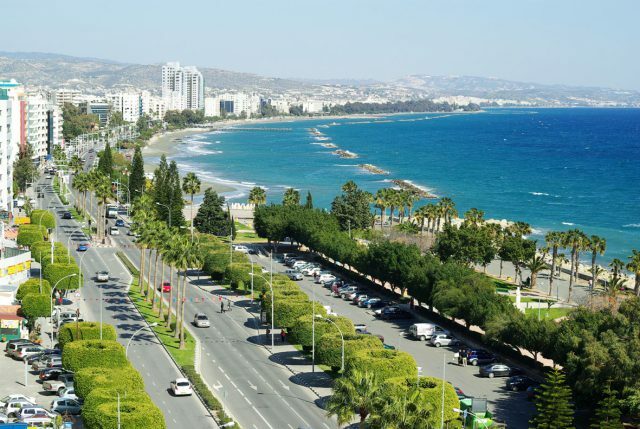 Larnaca - a large port city in Cyprus, rest in which it is considered one of the most inexpensive. Larnaca is famous for its ancient history. according to legend, it was founded by a descendant of Noah 12 century BC. The ruins of the ancient city can be seen, visiting the archaeological site of Kition is the old name of Larnaca. In the vicinity of many attractions of Larnaca, interesting for tourists, holidaymakers in Cyprus. Near the town, on top of a high hill, It is the ancient monastery of Stavrovouni. According to legend, Monastery was founded by Empress Helena in 4 century. The history of the monastery is full of tragic events. Today it is home to more than two dozen monks, subsistence. Only men are allowed to inspect the monastery. Women can visit the church, disposed before the gate conventual. 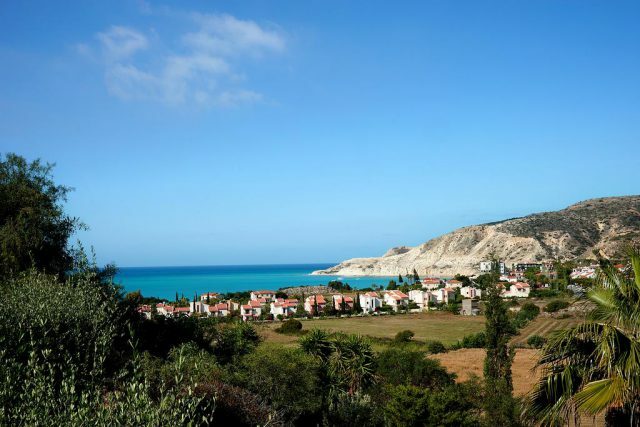 recreation program for Cyprus would be incomplete without a visit to the picturesque village of Lefkara around Larnaca. It stretches on the slopes, among citrus orchards and olive groves. The village is known for unique crafts: women make wonderful lace weaving, and men - manufacturer of silver jewelery. The village is open culture of Cyprus Museum, where you can learn many interesting facts. Rest of children in Cyprus will allow to diversify the Camel Park, where they can ride horseback on animals. The park has many different attractions, there is a mini-zoo and a swimming pool. But the most popular traveling on camels in the surrounding park. available lots of family entertainment parks for children in Larnaca, interesting for adults. Larnaca is known for the most inexpensive holiday in Cyprus. Its beaches are comfortable entering the water, fine soft sand, absence of sharp fluctuations of depth. Shallow water stretches for half a dozen meters from the shore, so that there are no big waves. Larnaca has hotels of different categories, and even five-star hotels are cheaper, than at other resorts of the country. Cyprus one of the best hotels to stay in Larnaca is considered to Golden Bay Beach Hotel 5*. The interiors are spacious apartments are made in a noble retro style. Floor-to-ceiling windows open onto a balcony or terrace, opening a wonderful panorama of the sea coast and the beautiful garden, ambient hotel. The wide sandy beach is just 100 m. For children there is a playground, and in one of the pools has a water slide. Wonderful vacation awaits you in a luxury hotel Cyprus Alkisti City. It is housed in a historic building 19 century, Located in the center of Larnaca. Local attractions are within walking distance, a clean sandy beach 100 meters. The hotel is surrounded by a beautiful tropical garden, which leaves a large terrace. It serves breakfast and dinners. The city of Limassol - the largest port and one of the most popular resorts for holidays in Cyprus. It is located on the southern tip of the island, in the Bay of Akrotiri, and stretches along the broad coastline with beautiful beaches. The exact date of its foundation is unknown, but the oldest of the found graves are 20 century BC. About the rich history of Limassol evidenced by the large number of historical finds. The town boasts many attractions, interesting tour for holidays in Cyprus. In the center of the Old Town is one of the most visited monuments of the Middle Ages - Limassol Castle. It was built to protect the city's port, around 800 years ago and became a silent witness to the endless military conflicts, earthquake and subsequent reconstruction. Today, the castle is located in Limassol History Museum with an exhibition of interesting exhibits - a knight's armor and weapons, household items and jewelry. The museum provides an excellent opportunity to get acquainted with the history of Cyprus during a holiday in Limassol. Some of the documents date the end of the construction of the castle 12 century, when the island was conquered by the Crusaders. Originally a fortress adjoined three tall towers, that disappeared as a result of one of earthquakes. From that time there was only a small chapel in the Gothic style, that stands yellowish building stone color. During a holiday in Cyprus tourists are happy to get acquainted with the historical sights. One of the most popular is Kolossi Castle - a sample of military architecture 13 century. Originally, the castle was possession loannite Knights, and later passed into the hands of the Templars. Well preserved main tower of the fortress, the height of which is 22 m and wall thickness of 2 m. On the roof of the castle is a viewing platform, which offers a picturesque view of the surrounding valley. Children stay in Cyprus will be remembered a visit to the largest water park on the island Fasouri Watermania. It runs from the end of the last century and has since been constantly expanding its territory. Today, the water park more 30 rides and swimming pools with water slides. Provided a variety of entertainment for all age groups. There is a playground for children, in which they expect real adventures on rope descents and swimming pools with slides and water cannons. The sandy beaches of Limassol, many consider the best holiday destination in Cyprus. They are characterized by easy entry into the sea, Some beaches are covered with dark volcanic sand, other - golden-gray. There are small bays with wild beaches. Many Limassol hotel has its own beach area, requisite infrastructure for a variety of holiday guests. Relaxing holiday in Cyprus will provide a five-star Four Seasons Hotel. He is buried in the greenery of a blossoming garden, and the beach area attracts cleanliness and convenience. On the site are two outdoor swimming pools and tennis courts. All conditions for children. Right on the beach is a children's club, that allows parents to rest easy, I am with child. A wellness center and a diving school. The best holiday in Cyprus will provide upscale resort hotel Amathus Beach. Spacious, comfortable rooms with a balcony or terrace overlooking the blossoming garden, which features two large pools with sea water. The spa has a relaxation area with green area. For children equipped with a mini-pool with slides, There is a club with animation and three-time buffet. On the beach water sports center. Lovers of a relaxing holiday in Cyprus can choose the charming resort town of Pissouri. He is buried in lush greenery, and its extensive coastline, covered with sand or small pebbles, It stretches nearly a half kilometers. Pissouri resort infrastructure began to develop in the 80s, so there is the national color of Cyprus has remained largely. It is possible to combine a beach holiday in Pissouri with a tour of the surrounding attractions Cyprus. The main temple of Pissouri, dedicated to the Apostle Andrew, It stands on the central square. Its construction took almost half a century. In the end 19 century, the church was set a beautiful carved iconostasis, made by local craftsmen. Climbing up to the observation platform, you can admire the fascinating panorama of the green valley. Special attention of tourists in Cyprus tourists is St. Mauritius Church. It stands on one of the surrounding hills, among the tall cypress trees. residents believe, Holy Mauritius was a healer, and treatment is even land, the surrounding walls of the church. Nearby is old water tank, the remainder of the water supply system. On the beaches of Pissouri is a lot of fun, make holidays in Cyprus varied and exciting. Surf coast attracts good waves, divers - clear sea and amazing underwater scenery. Fans of extreme sports can take part in a parachute towing flights. In the picturesque surroundings of the resort paved bike trails, in a small distance there are golf course. Pissouri beaches - one of the most convenient in Cyprus, that makes a holiday unforgettable. They are located in a picturesque bay, surrounded by white rocks. Over the rocks also have a small cove with wild beaches. Along the coastline extends convenient footpath. Pissouri hotels do not have their own beach area, but many of them are located in close proximity to the coast. A quiet relaxing holiday in Cyprus, away from the noisy rave places, provide hotel Columbia Beach Resort 5 * .Ego luxury apartments open onto a balcony overlooking the lush garden or the bay. The rooms are also many fresh flowers. The beach is 100 meters from the hotel, but on its own territory it offers a huge swimming pool and spa with a gym. Who can go dancing or table tennis. Excellent conditions for families with children in Cyprus offers hotel Pissouri Beach Apartments. It offers bright, cozy apartment with a furnished terrace and a fully equipped kitchen with modern amenities. Terrace descends to the lovely garden with fragrant lemon trees. There are tennis courts and an outdoor swimming pool with children's area, and the beach is 300 m.
Starting from mid-December open ski resorts in Cyprus for fans of winter recreation. In the mountains there are pistes of different difficulty levels, including, for beginners. Every year they are international tournaments. Ski clubs Cyprus take athletes from other countries and share experiences with them. You can stay in comfortable hotels, scattered in the mountain villages.